PVC strip curtains offer an economical solution to protect employees and goods from adverse environmental conditions such as noise, heat, cold, humidity, dust and drafts. 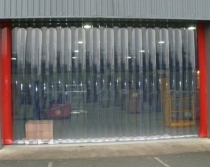 If you wish to maintain an ambient temperature for your warehouse or cold store, keep out unwanted pests, restrict the movement of air pollutants or isolate noisy machinery, a strip curtain may be for you. Our plastic strip curtains offer a high degree of clarity that ensures clear visibility to and from your working area and you can choose from either full or partial overlap dependant on your requirements. As standard we supply clear strip curtains with solid colour red marker strips so to ensure best positioning when passing through. Alternatively for refrigeration purposes we also offer a polar grade clear PVC strip curtain which remains unaffected in temperatures as low as -45 degrees.